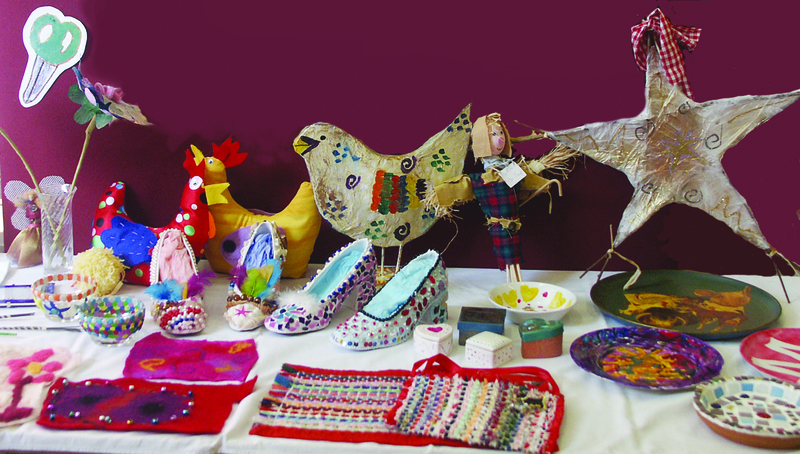 Sherston Young Craft Group is for young people aged 9 and above. We meet on Monday evenings from 6.45 – 8.15pm in the small hall of Sherston Village Hall, from September to May. Crafts include fabric painting, papier mache, embroidery and clay modelling. Sherston Young Craft Group has been involved in the following projects for the community – the purple altar frontal for the Church of the Holy Cross (used for Lent and Advent), a log – cabin patchwork which hangs in the waiting area in the Tolsey Doctors’ Surgery, and the banner made for the opening of the new Village Stores and Post Office in 2011. Now we are preparing for a new project, this time for the Village Hall, in association with the ‘Wild Sherston’ weekend. We have been awarded an Intergenerational Grant from Malmesbury Area Board, which will pay for materials, to produce wallhangings for the Village Hall. We will print the wallhangings during our regular sessions but members of the community will also be able to help print them during the Wild Sherston Weekend. They will have a local wildlife theme. Photographs show our members working during one of our sessions and also a display of past projects. This entry was posted in Arts & Drama, Children & Young People, Clubs & Societies. Bookmark the permalink.